AFTER waiting four years for his name to be called out at the NAB AFL Draft, ruckman Darcy Cameron might get a chance early in 2017 to show his wares with Sydney. Interrupted pre-seasons to Grand Final ruckman Sam Naismith and ruck-forward Callum Sinclair has raised the prospect of Cameron being given the opportunity to impress during the JLT Community Series. He has trained well since joining the club with pick No.48 in the 2016 NAB AFL Draft and joined Kurt Tippett in doing most of the sessions in pre-season. Coach John Longmire said the early signs from the 21-year-old, who played with Claremont in 2016, have been positive. "Cameron has been really good so far," Longmire told AFL.com.au. "He's still learning the game but he's been really good." Competition for ruck spots will be hot in 2017 at the Swans with Tippett the only automatic selection at this stage of the season. Naismith finished the season off well and was very good in the first half of the Grand Final, however post-season shoulder surgery has restricted his ability to participate in much competitive work. Sinclair, who started well last year after crossing from West Coast, has only just returned to full training after suffering a knee injury in 2016 that ended his season after round 18. It's made predicting the Swans' ruck set-up impossible with Longmire admitting a clear picture was yet to emerge but he was pleased with the quartet available to him. "I have always been a believer in having a strong ruck core group. It changes. It changes all the time," Longmire said. Meanwhile, Longmire said he was only just getting a good look at the club's second pick in the NAB AFL Draft, Will Hayward, and the early signs were very positive. 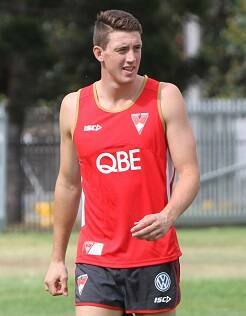 "He is now into the ball work and he looks really good," Longmire said. "We're just getting a look at him now. He's been building up his fitness to this point." Oliver Florent has also had a strong pre-season, with the youngster praising the guidance he has received from All Australian and Swans' premiership defender Nick Smith.